Lorenzo Pastrana has a PhD in Pharmacy and is full Professor of Food Science at the University of Vigo, Spain (www.uvigo.es). He has 25 years experience in research and teaching in the areas of Food Processing, Biotechnology and Bionanotechnology. He is currently the head of the Department of Life Sciences at INL, composed nowadays by 30 researchers. He is author of more than 120 scientific papers and PI of more than 30 National and European research projects and contracts arising funds around 2500K€ in the last ten years. Research: As a whole, his research follows a multidisciplinary approach working in the following main topics: 1: Biotechnological valorization of by-products and food processing wastes to obtain high value bioactive molecules 2: Development of new food products and functional ingredients (antimicrobial, probiotics, antihypertensive and antioxidant) integrating bio- technologies and new new processing (nano)technologies. 4: Active, smart and edible food packaging systems. Prof. Pastrana is author of 7 patents (4 of them licenced) relating the development of new food products and process as well. 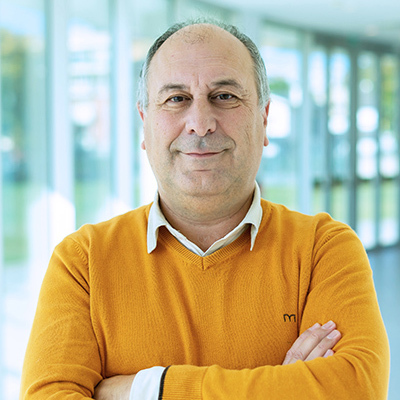 Management and Knowledge Transfer: Prof. Lorenzo Pastrana was Deputy- at the Faculty of Science, University of Vigo. He was the first Director of the Research and Knowledge Transfer Centre of the University of Vigo (www.citi.uvigo.es). Prof Pastrana was also the Head of Knowledge Transfer Office at the University of Vigo and the founder of the Galician Agri-Food Technology Platform involving more than 140 food companies, and RTDs to foster R&D projects. Cerqueira, M.A., Fabra, M.J., Castro-Mayorga, J.L., Bourbon, A.I. Pastrana, L.M., Vicente, A.A., Lagaron, J.M. Use of Electrospinning to Develop Antimicrobial Biodegradable Multilayer Systems: Encapsulation of Cinnamaldehyde and Their Physicochemical Characterization. Food and Bioprocess Technology, 9(11), 1874-1884. 2016.